Alter The Press! 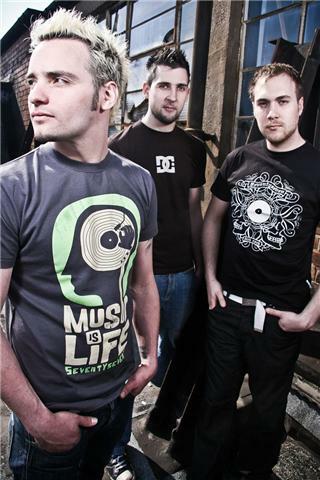 spoke to Birmingham trio Templeton Pek recently. With several EPs and one album under their belt along with shows alongside The Blackout and more recently, Story Of The Year. They're now self-producing and slef-releasing their second album and recently released a free single, 'Barriers'. The group talked to ATP! about the new releases, playing with Story Of The Year and more. Alter The Press! : How would you describe your sound for people who don't know you? Where do you draw influences from? Templeton Pek: We're an energetic melodic fast rock band with a punk rock DIY ethic, I guess influences come from loads of things really, we all have pretty broad range of tastes. Obviously a lot of the backbone of our stuff is punk based....but we're definatly a lot more than that. We just appreciate good songs and melody is key with us. Touring so much since the last album has helped shape songs too as you see how they transfer live and generally become better at what you do. ATP: The upcoming album is your sophomore release, something which can be quite a challenge for a band in many ways. Are you worried about how it will be received? Did you make any drastic changes stylistically etc? TP: It was definatly a challenge as not only is it the dreaded second album, we decided to record it and produce it ourselves which has been a total learning curve. I'm not worried how it'll be recieved at all, as it is about as close to being us unfiltered as you can get. It won't follow into any of the current trends being forced on everyone and for that we're massively chuffed. Its just us being us, and if people like it it's a bonus, but we havent gone out of our way to try and sound like the current cycle that's in fashion. ATP: Did you enjoy the writing process? What can people expect from the new album? TP: Yeah it was fun jamming out new ideas and actually writing for an album, as the first release was technically two EP's. We were actually homeless in regards to rehearsal space in the middle of writing, someone was kind enough to use their space in a warehouse towards the end of writing, but it was dead of winter and there was one small light and no heaters. So playing new songs in those conditions definatly tests your patience and how much you like them. We also got the chance to demo stuff and actually have some form of pre-production. People can expect better songwriting, performance and a natural energetic sounding album. It's definatly a progression in all areas I think. ATP: Your single 'Barriers' was recently released as a free download, why did you choose to do it that way? How have people been responding to it? TP: The idea was to give people a taste of what's coming, and to be honest we felt like we were sitting on our hands a bit and wanted to show people what we've been working on over the last few months. Pretty impatient but I think its starting to pay off. We've had a great response all round so far. We've had massive sign ups, messages from fans and industry alike. We managed to get airplay on XFM and 'Single Of The Week' on Kerrang! Radio without a PR campaign behind us. True DIY. ATP: Your songs have a huge amount of energy to them, how important for you is that when playing live? TP: It's massively important to us, we are an energetic band and that needs to come accross on record which isn't easy to do. Live shows are really key for us as that's where most people get into us, as I said before touring so much over last 2-3 years has shaped the way we write. ATP: You recently got to tour with names such as Story of the Year and Goldblade, what were the guys like to tour with? Any funny anecdotes to share? TP: Both bands were awesome guys and really accomodating to us. Every tour we seem to be cursed with a transport gremlin though. On the second day on the Story Of The Year tour from Oxford to Norwich our trailer tyres collapsed and started smoking. We had to send our roadie and the trailer back home and carry on with literally our guitars and cymbals. When stuff like that happens it just spurs us on to play better. We toured Europe with The Blackout in December last year over 9 countries and every date there was some kind of problem we had to deal with, from blow outs to sat nav failure, but we made every show, just about by the skin of our teeth. There's something surreal about arriving late in Prague loading in, while the crowds already in the venue, and just playing straight away. Before you know it you're in the bar asking yourself 'did that just happen?' But that SOTY show was probably the best of the tour for us, as we were so fired up, we cleaned up on merch after too. We're lucky we have awesome people that work with us. ATP: Who would be your dream tour buddy and why? TP: If you mean person to come on tour with me? Famous? That'd be hard, it'd have to be either Natalie Portman for obvious reasons, or maybe a comedian like Eddie Izzard to keep us laughing through the constant breakdowns. Maybe an amalgamation of the two? Actually no that'd be wierd, Eddie Izzard wears girls clothes doesn't he? Lets go with Izzard, Portman can wait till the next tour. ATP: What's the plan for the future? TP: Get the album out so everyone can hear it, and tour it everywhere we can so everyone can see us live, so keep your ears and eyes peeled its on its way. Templeton Pek on MySpace and Facebook.